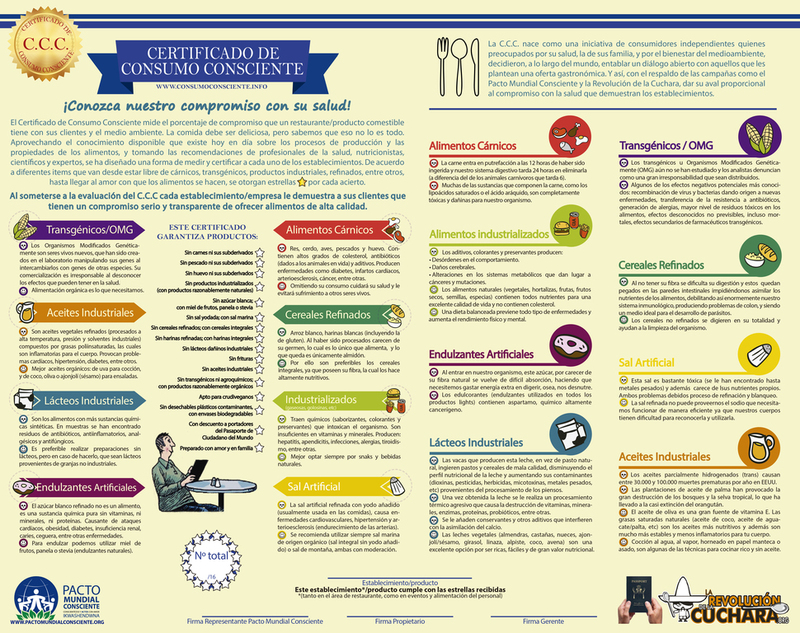 With this Conscious Consumption Certificate (CCC.) you measure the compromise that the restaurants have with the health of their customers. When a restaurant fills all the requirements of quality, related with the kind of ingredients, their origin and the way of cooking the food, then they acquire a C.C.C with the maximal number of stars (16). restaurants or enterprises of gastronomical products offer to us, when the quality refers to a healthy nutrition that is not detrimental to our own health, name it, highly refinated products (and toxic), or transgenically modified food, without any guarantee that their consumption will be, in long terms, beneficial for their consumption. The industrialization of the food industry doesn’t have as a goal taking care of our health or taking care of the environment and the consequences of that are starting to let themselves known, all around the planet. This certificate was born as a try to be able to educate ourselves and becoming more conscious of the consequences that come with what we consume, and looks to bring a change in the way of thinking and the mentality, for the sake of finding ourselves, in a estate of a mature humanity, that will be shown in a respectful and conscious consumption, not only from ourselves, but also from the beings that we coexist with and the environment in general. The restaurants that haven’t reach the maximal grade yet, can begin to acquire stars gradually, being qualified from 1 to 16 stars. The goal is to promote a better nutrition and to estimulate the compromise of those who cook our food every single day. You can download the certificate HERE, use it on your restaurant or inviting other establishments to acquire it.